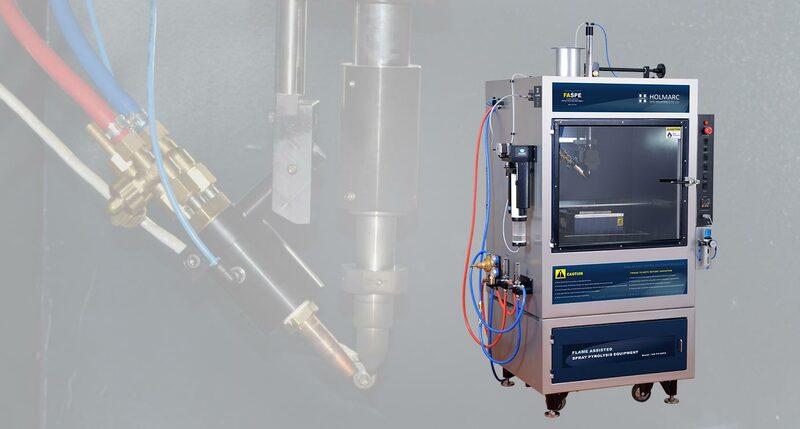 Holmarc's Flame Assisted Spray Pyrolysis Equipment Model : HO-TH-04FA has been developed for research in surface quality improvement of metallic alloys and ceramics. In this technique, solution is sprayed on to a heated substrate through an oxygen-acetylene flame. The equipment is fitted with accessories required for controlling the flame during the process. The solution is spayed using a positive displacement pump and compressed air through a mixing chamber and nozzle. The substrate is placed on a hot plate, temperature of which can be set at the desired level through a dedicated controller. The hot plate is mounted on a motorized XY platform to move the substrates during the coating process in the required sequence so that uniform coating is achieved. Flow rate of the solution and motion sequence of the substrate are controlled through a personal computer. The flame is initiated and set at the required intensity level manually using the control accessories fitted with the equipment. As the solution is sprayed with the help of compressed air, the equipment can be used for spray pyrolysis without flame as well. Combination of pyrolysis thin films with and without flame can also be produced on the same substrates in successive operations. Spray pyrolysis is a process in which a thin film is deposited by atomizing and spraying a solution on a heated surface, where the constituent reacts to form a chemical compound. In flame assisted spray pyrolysis, this spray is heated by a flame produced by an oxy-acetylene gas mixture, before being deposited on to the substrate. The chemical reactants are selected such that products other than the desired compound are volatile at the temperature of deposition. 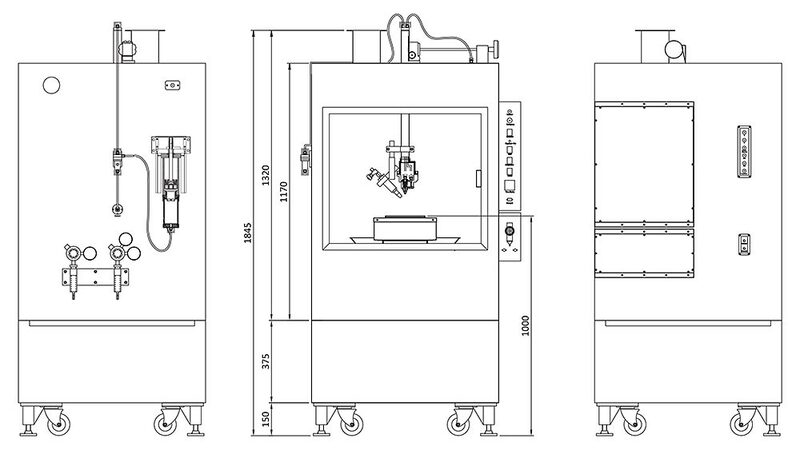 The process is generally useful for the deposition of oxides on to metal and ceramic substrates and particularly suitable for the deposition of Al2O3, ZnO and metastable solid solutions of ZnO-MgO and ZrO2-Y2O3 on amorphous silica and Nickel based super alloys such as Nimonic-90. Sprayer traverse : X - Y 100mm max. Glass container holds the solution to be sprayed during the coating process. Containers of two volumes (250ml & 50ml) are available as standard accessories. This tube carries the solution from the glass dispenser to the spray head. Nylon is resistant to most of the chemicals which has applications in spray pyrolysis.